Hot sauce, chili sauce, or pepper sauce are all spicy condiments made from chili peppers. 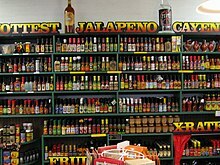 Wikimedia Commons has media related to Hot sauce. This page was last changed on 4 September 2013, at 06:45.